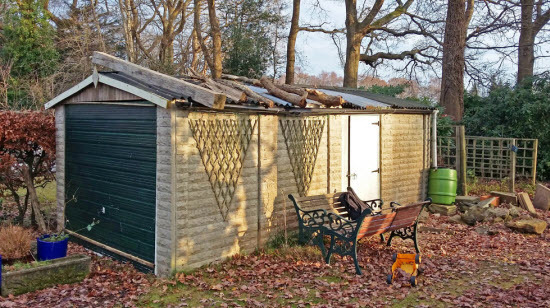 Is a shed repair feasible for your shed? The types of shed repair that I undertake come in many different varieties. Whatever the problem you have with your shed, I would hope to be able to come up with a solution. The main thing is to tackle a problem early, as soon as you are aware of it. Following the old saying 'A stitch in time.... saves nine'. 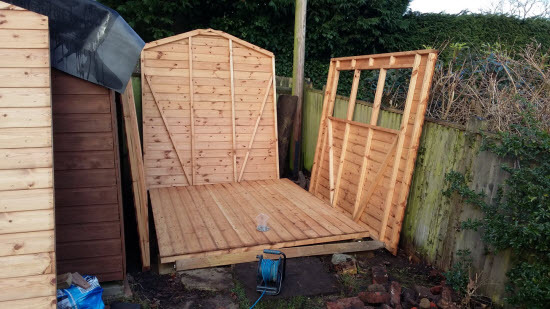 Have a look at the pictures and categories of shed repair below for an idea of the sort of problems and solutions that I can help you with. However shed felt doesn't last very long, 3-5 years for the cheapest variety, and you often only realise it is leaking long after the water first started to come in. This means that the roof deck and timbers may have already started to rot and the contents of the shed may have become water damaged. 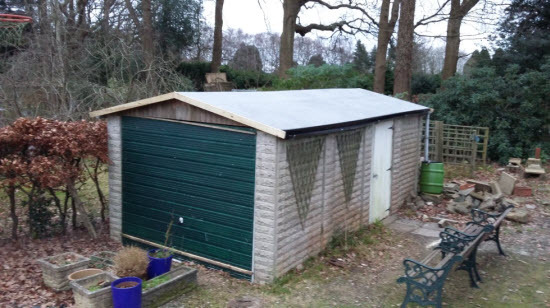 The material that I most often use for a shed repair to this type of roof is called EPDM (Ethylene Propylene Diene Methylene) which is an artificial rubber. It is strong, stretchy and long lived. 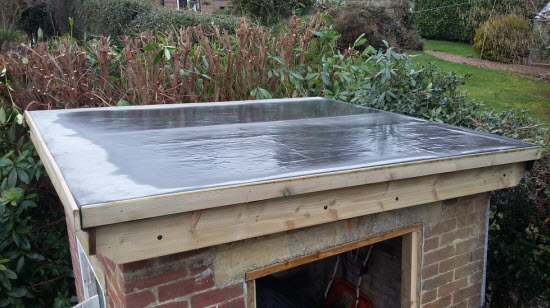 EPDM is supplied as a singlesheet that has been cut to the size of your shed, so that there are no nail holes or lap joints as potential sources of leaks. 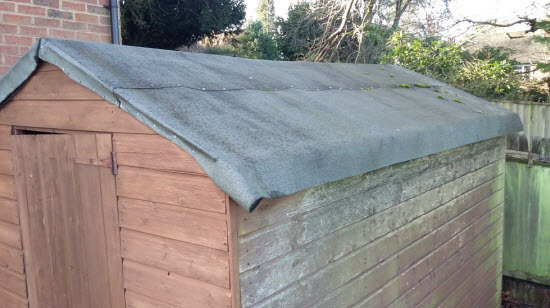 EPDM costs a bit more than standard roofing felt but when you consider the cost over its potential 30+ year life, the labour saving of not having to repeatedly re-cover your shed roof and reduced damage to the contents of your shed it comes out much cheaper. More on the benefits of EPDM shed roofs. 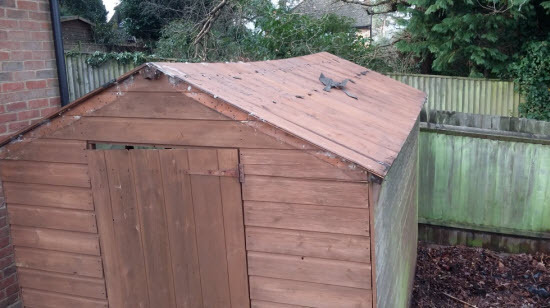 Have a look below at a couple of examples of this type of shed repair. 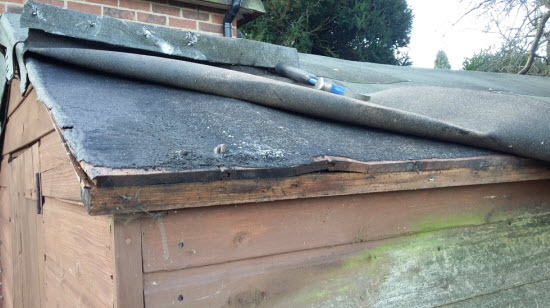 This shed roof had needed repairing for at least a couple of years. It was in a fairly bad condition. The same shed after replacing the roof deck and installing epdm sheet. From the outsided this roof looked as though it was waterproof. As roof replacement started it was obvious that small cracks and holes in the felt were letting in enough water for a number of slugs to thrive. Shed roof after removal of old shed felt. This roof was caught just in time, no timber repairs required. 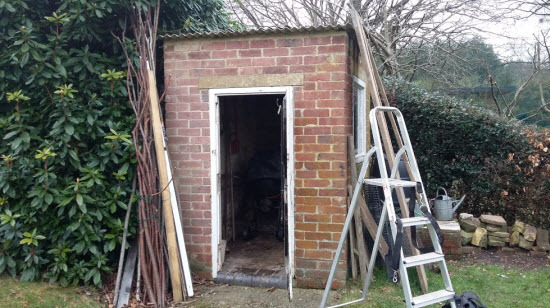 The old shed, on the left, with its new EPDM roof. 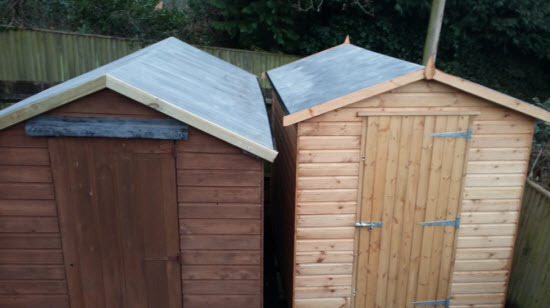 A new shed was built next to it that incorporated EPDM from the 'get go'. 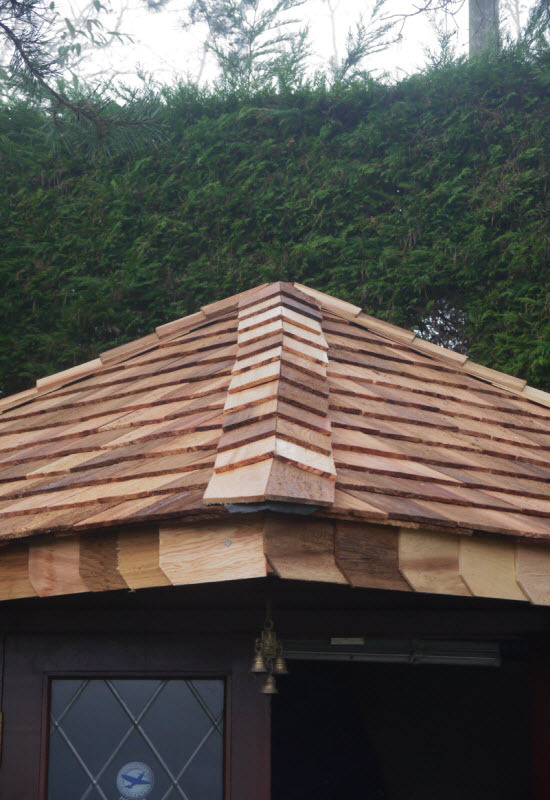 Cedar roofs look beautiful and are durable but eventually the cedar shingles come to the end of their life. For this shed the downfall was a build-up of pine needles on the back of the shed. 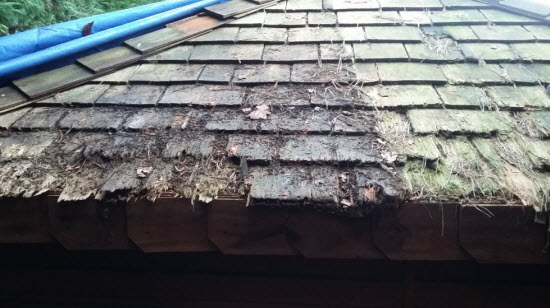 The pine needles held on to the water and eventually initiated decay in the outer layer of shingles. 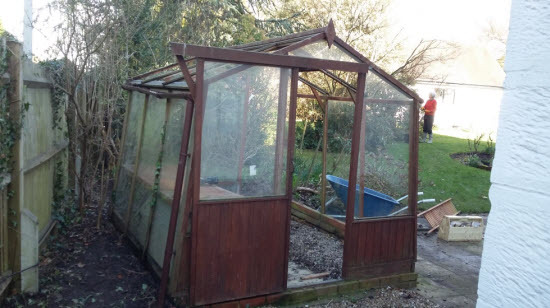 Despite this situation, which included finding several slugs living in the roof!, the roof lasted over 20 years and the roof remained largely waterproof. 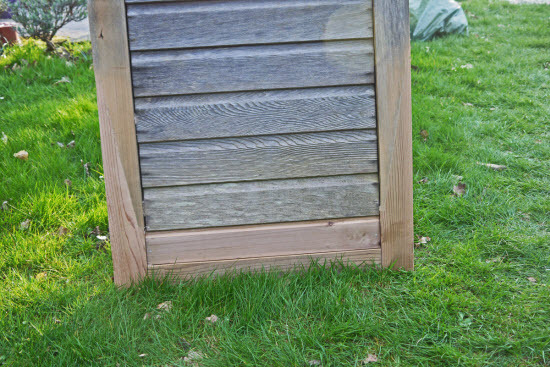 Cedar sheds are expensive, they age gracefully into the garden to a lovely silver grey colour. 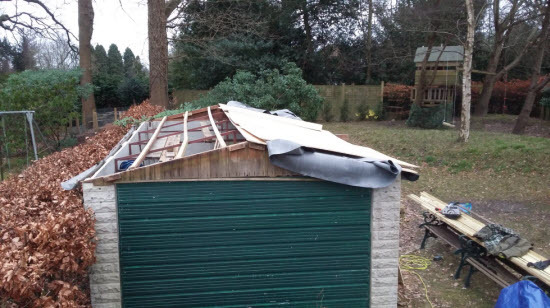 Occasionally the weather and water will find a weakness and so a local shed repair is needed. 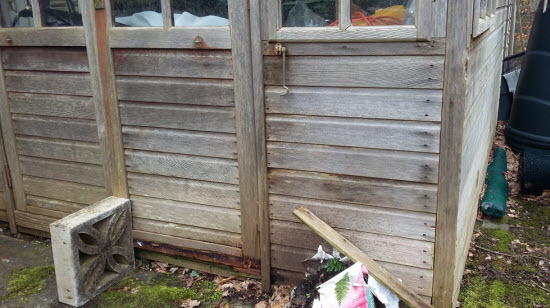 This shed had been sitting in a small puddle for the last 20 years which had caused the timber bearer, the bottom of the door and frame to rot. I replaced the timber bearers with recycled plastic so that the wood would no longer soak up the moisture. Then rebuilt the bottom of the door and door frame, splicing the new wood into the existing with glued scarf joints and oak dowels. View of front of cedar shed. The bottom of the doors and front panels had disintegrated due to timber decay. View of repaired cedar door frame with new timber spliced into the existing. 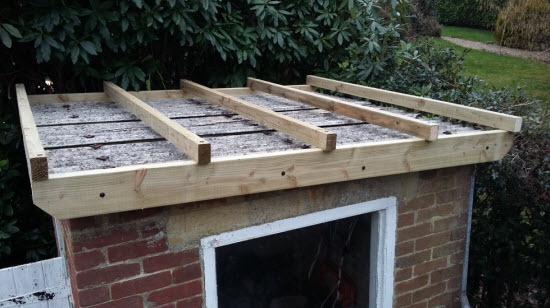 Sometimes a shed roof repair will involve removing the existing roofing system (most often traditional felt) and also repairs to the roof structure. 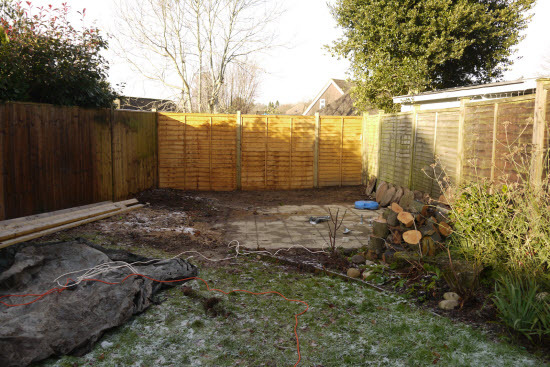 Although the repairs can look extensive the total repair cost often comes to around 1/3rd the cost of a new shed. A lot of the price of a good quality shed is in the cladding. The existing roof was of corrugated bitumen sheets. It was held in place by some fairly large logs! 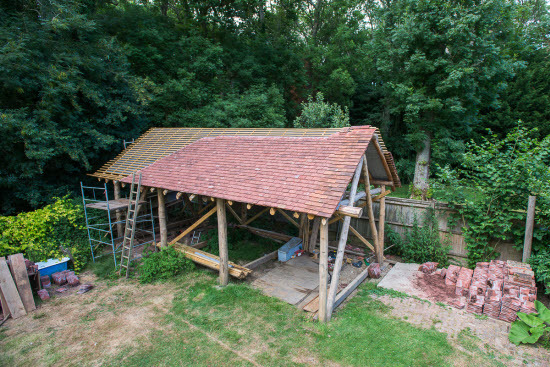 The existing roof structure was adapted to support a new EPDM roof supported on OSB (Oriented Strand Board) panels fixed to timber and steel. 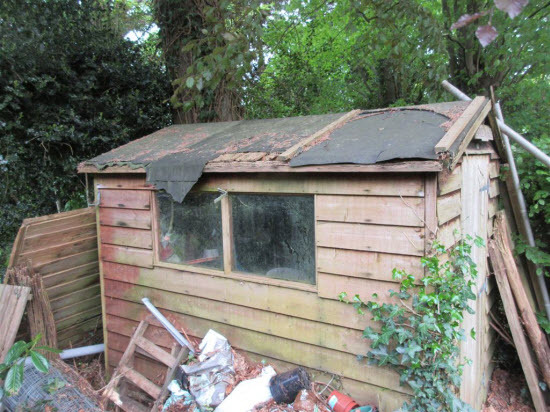 The structure of this shed was sound but it was suspected that the roof contained asbestos. The roof was leaking and the existing fixings had corroded through (after 40 years service!). Rather than disturb the in-situ asbestos an over-roofing solution was adopted. Leaving the existing roof undisturbed beneath. 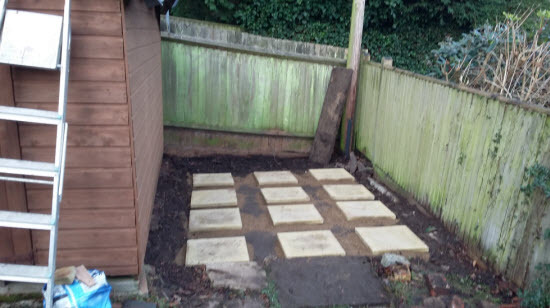 A series of flagstones on compacted ground is often enough to support the bearers for standard storage sheds. 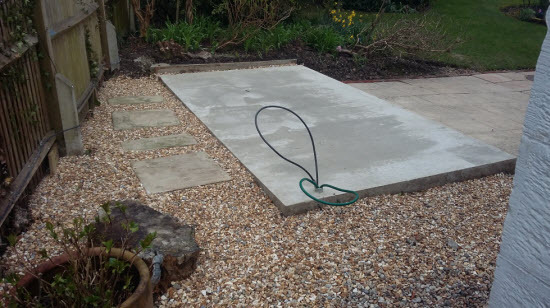 A concrete shed base is one of the most robust (and expensive) forms of shed foundation. Existing base after removal of the superstructure. 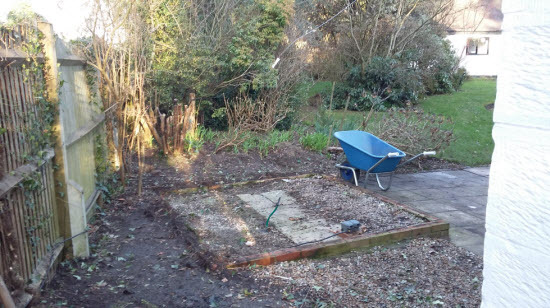 This was dug out and the levels adjusted to suit the size and shape of the new base. New base with provision for power and water supplies. The electrical supply is to be connected to a new fusebox by a suitably qualified electrician. Incorporating water and power enabled the client to control the climate inside the greenhouse via her mobile phone whilst away from the house. Sometimes the offerings provided by manufacturers of standard sheds don't meet up with your requirements. If you require something bespoke, of a specific size or style then contact me. 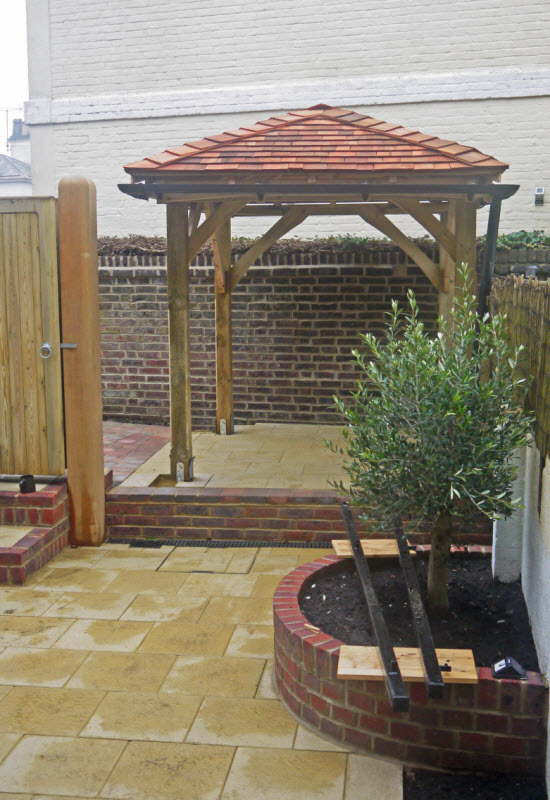 This client had a small garden and to maximise the use of it needed a gazebo and storage shed built to precise dimensions. As well as fitting like a glove, I think that the sheds look good too. 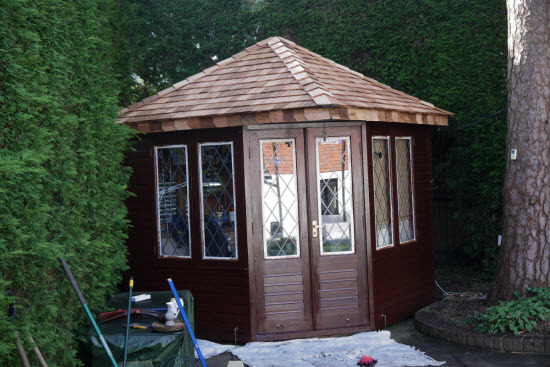 The cedar roofed gazebo was made to fit perfectly on the raised plinth. 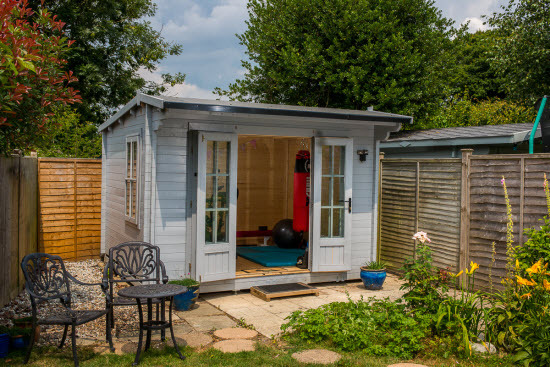 This small storage shed was designed to fit perfectly between the house wall and the fence. 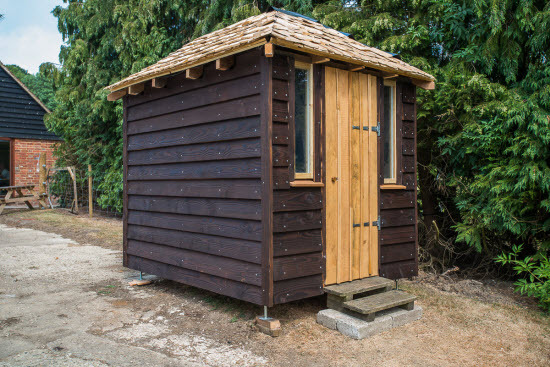 8x6 shed with shou-sugi-ban douglas fir siding and cleft sweet chestnut shingle roof. Shed kits come in a variety of formats; suffice it to say that I have come across the majority of them. 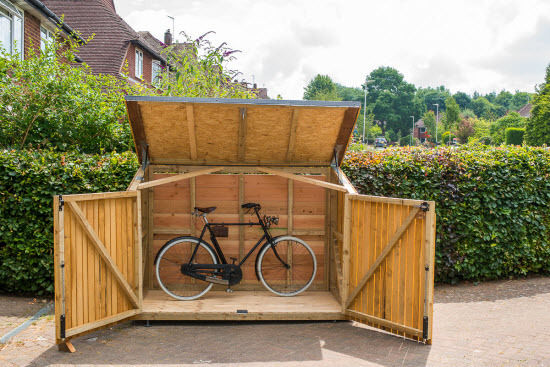 Some shed suppliers offer an assembly service. However I can offer a local package of foundation preparation and assembly that I hope you will find unbeatable. 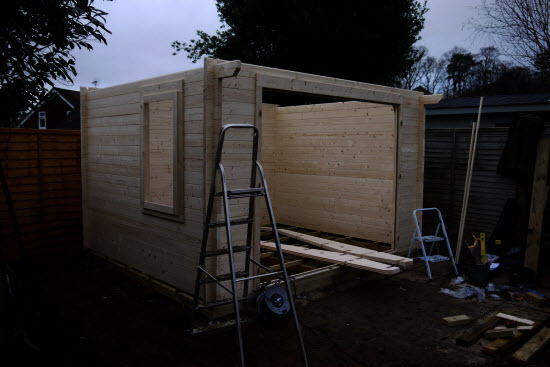 Have a look below to see an example of a timber log cabin at the start, middle and completion. 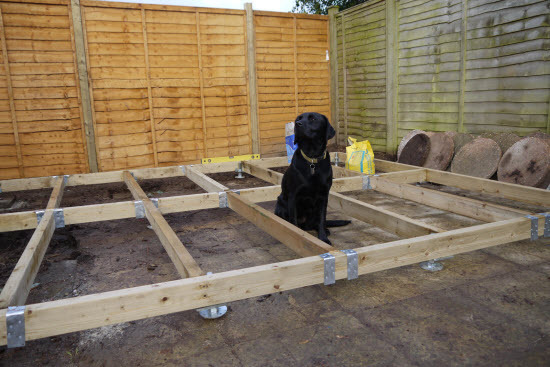 Stage 3 - Shed kit during construction. Walls complete. Door, windows and roof still to be installed. 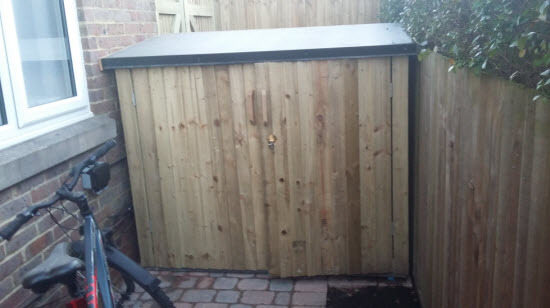 Panel sheds are fairly quick to assemble but combining them with an epdm rubber roof from new will give you a shed that will last for years. 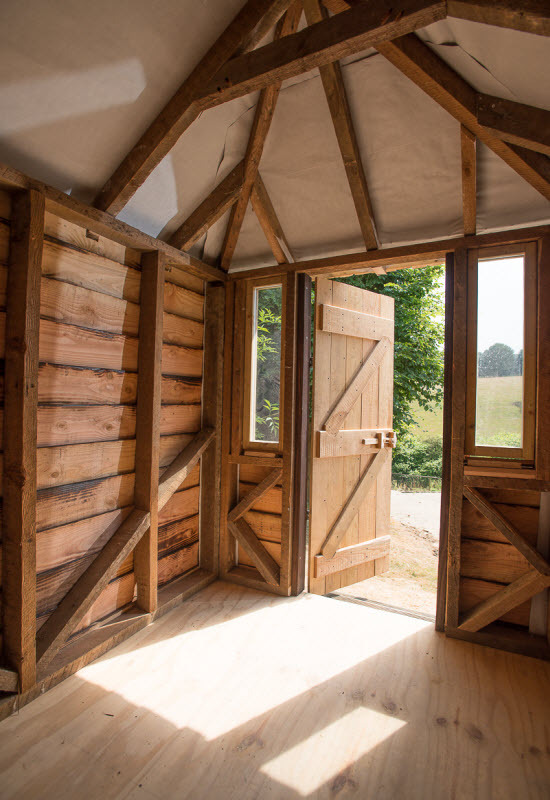 Many older shed windows are made from thin 'horticultural' glass whereas other windows are made out of pvc sheet. The thin horticultural glass is fragile and when broken is shatters into 'dagger like' shards. The PVC sheet is often just plain flimsy. 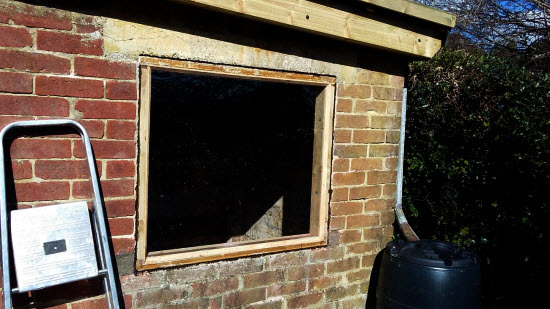 I can replace both types of shed window pane and also make new shed window frames. 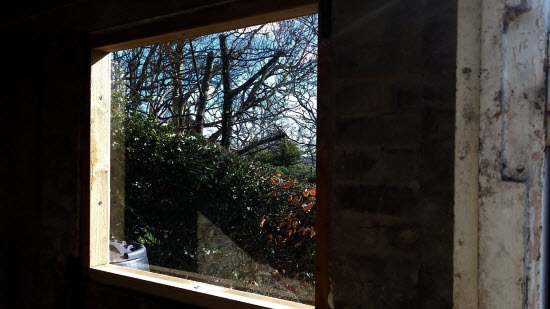 For replacement shed windows I recommend using polycarbonate (for impact resistance) or toughened glass. I have described a lot of projects above keep implementing new and innovative solutions. 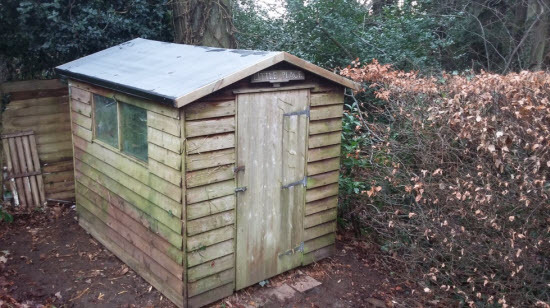 For 2019 I hope to install my first rotating shed. George Bernard Shaw was a big fan of these in the early 1900s. I have a bearing and platform for smaller sheds (up to 6'x6') in stock. And designs for larger sheds tucked away for when the occasion arises.